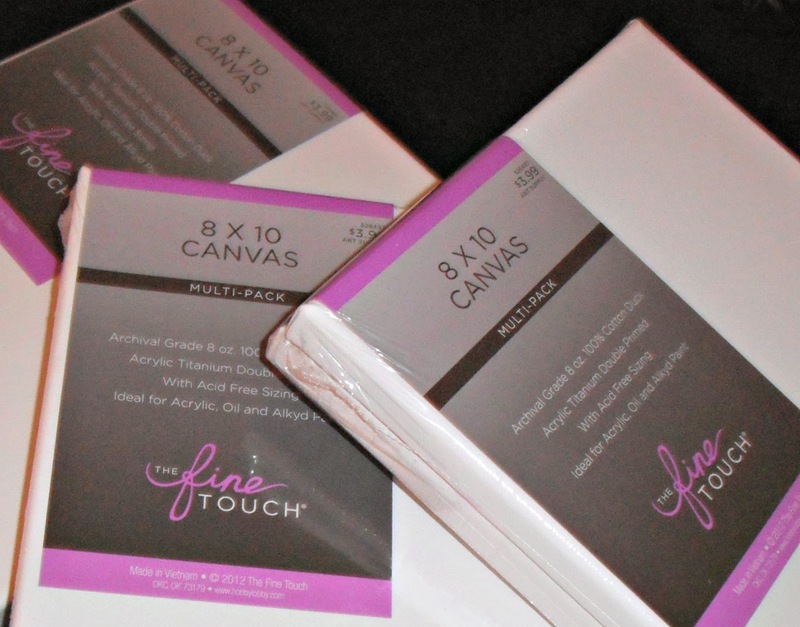 A little while back I posted about some canvas I got for making some personalized art. This is what I decided to do with those small pre-stretched canvases. I bought these at Hobby Lobby for a total of $12. They came in packs of two for about $4. I thought they were the perfect size for a family craft I wanted to make. 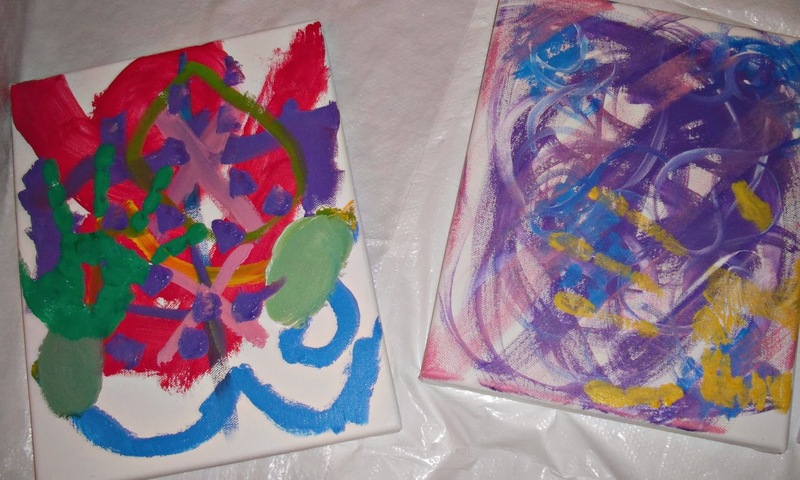 I have three small kids and because of their ages we can't make complex or laborious art together yet. Nevertheless, I wanted to make something nice with their handprints but have it be more permanent and not too dated. The turkeys, the penguins and the flowers on construction paper are nice but they weren't what I was looking for. 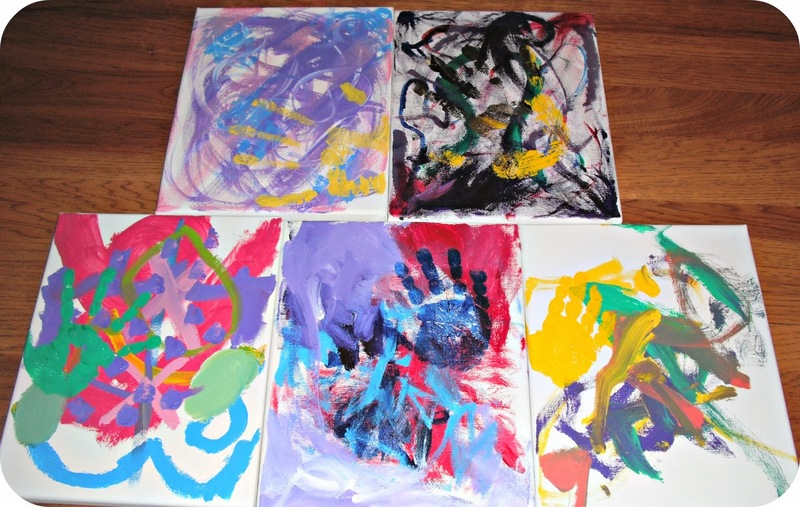 So I started searching and found handprint art I actually liked on Pinterest. Out of all the handprint art I've seen these kid handprint ghosts are my favorite. I took that idea and to make it more fun by having them add a modern background. I think they turned out rather nice. I find this project works best spaced between two sessions. One for the background work and one for the hand printing over top. That is unless, you want your handprint to smear into the background (which could look nice, too). 1. Prepare your painting area. 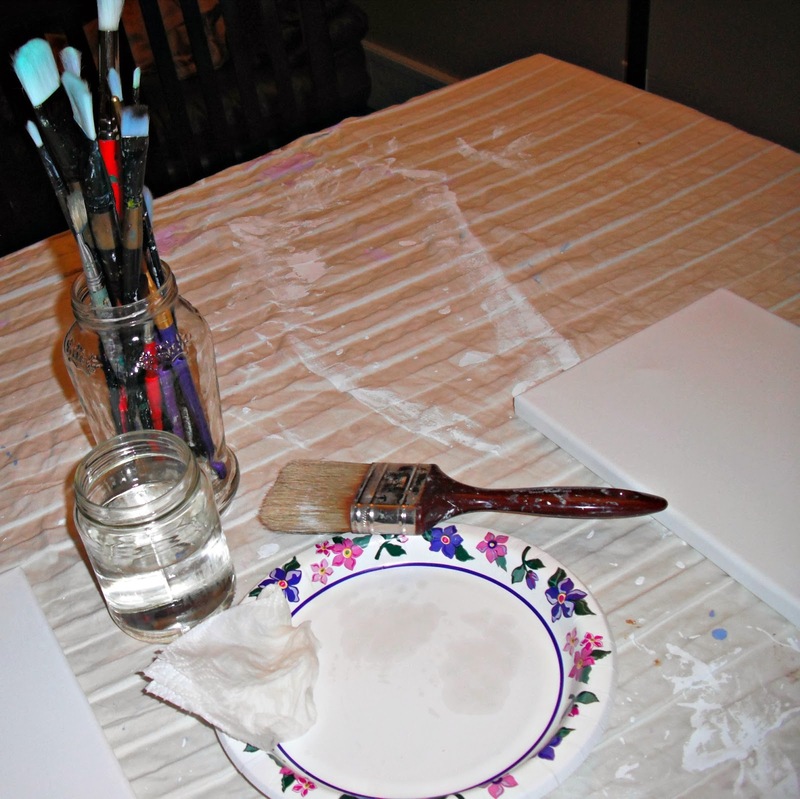 If you are painting on a table be sure to cover it. Cover the chairs, the floor, anything in the area. 2. Prepare your kids. Make sure they have on mess making clothes and aprons. 3. 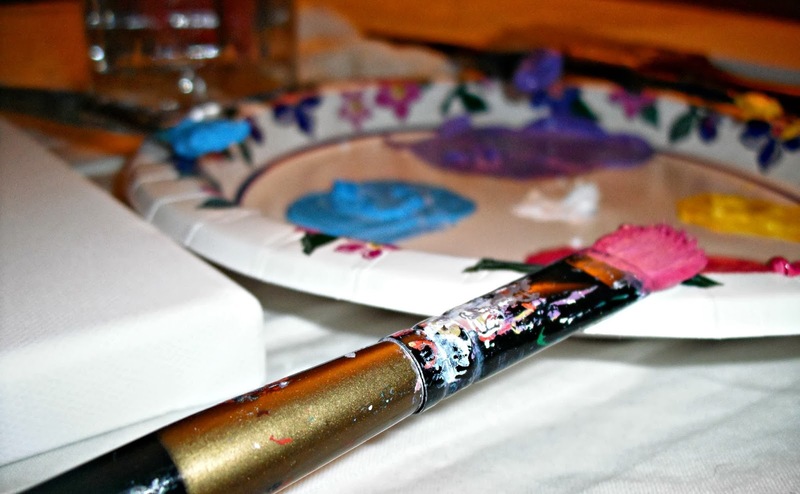 Put several colors of paint on each paper plate. (If you want variety, give each kid one special color that is different than the others). 4. 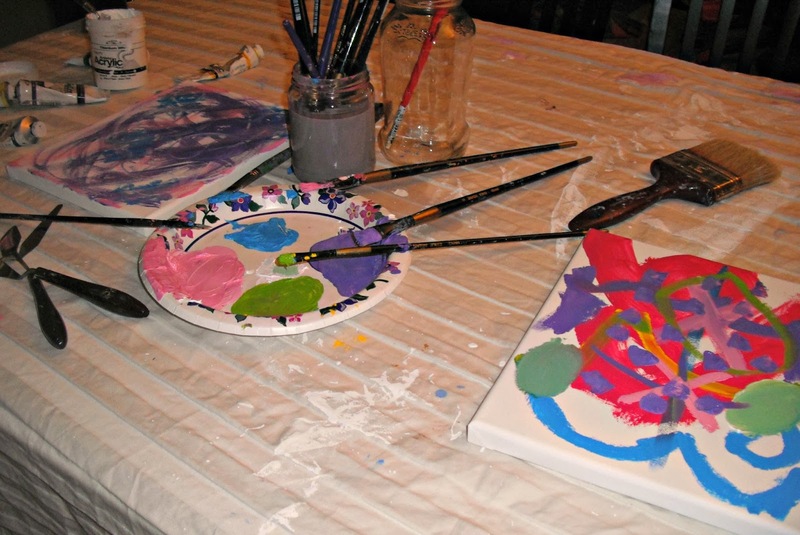 Have your children paint their canvas in the various paints and using various paintbrushes. This is mine in progress. 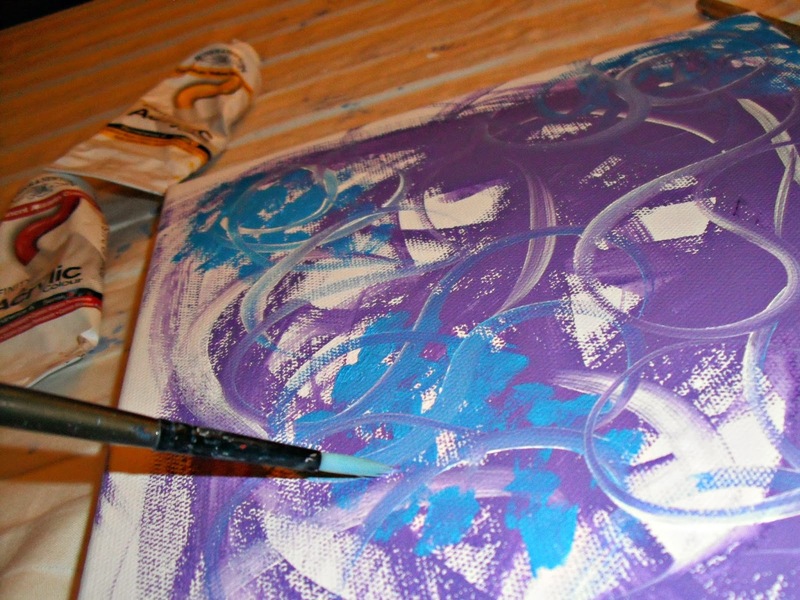 This is Little Miss's art in progress. This is Mr. A's progress after the first day. I didn't get an action photo of his because I was afraid of what he would do if both my hands were busy. He did manage to get paint up his nose when I wasn't looking. The whole 3 seconds I wasn't looking. 5. Let the paintings dry. 6. 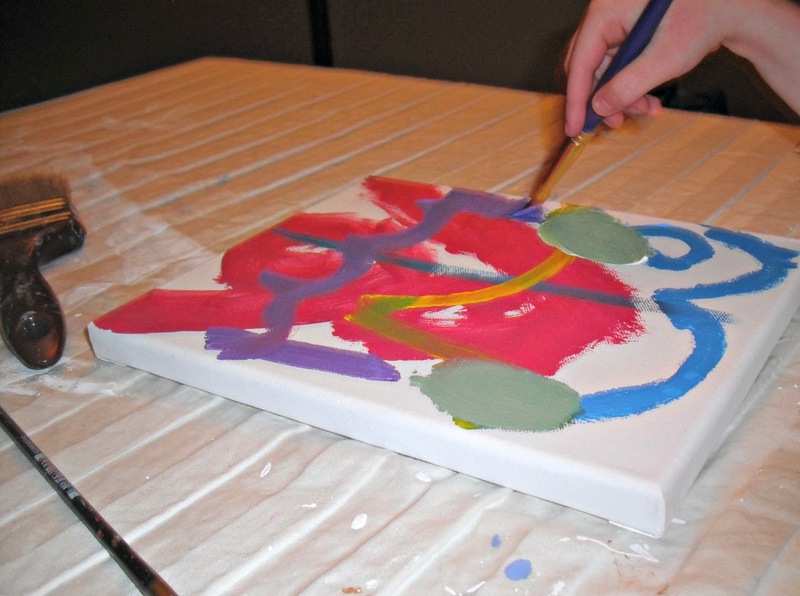 Paint your child's hand with paint and help them stamp it onto their canvas. The more paint on the hand, the larger and heavier the imprint will be. 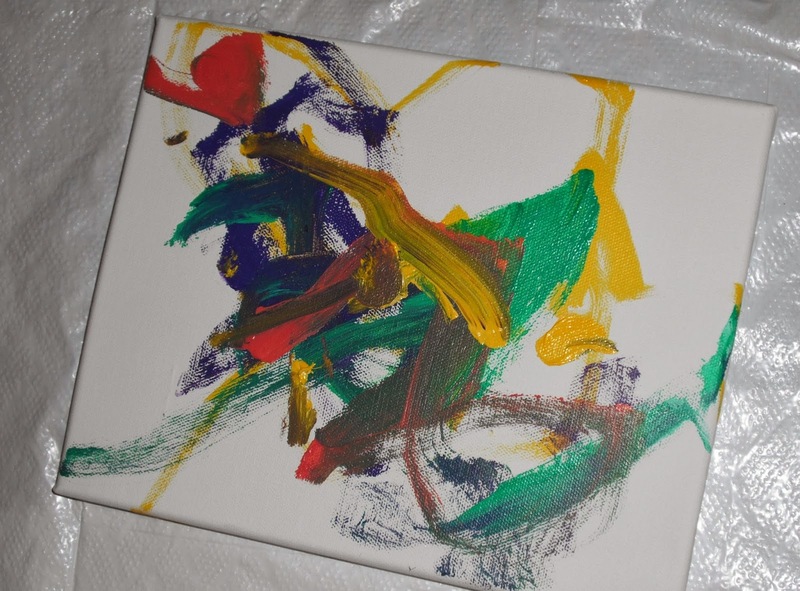 Little Miss's hand was thoroughly coated while I painted lightly and worked my paint into my hand. You can see how her print is fuller and mine shows more ridges and is fainter. *I am currently doing this is shifts. I tested it with myself and Little Miss. I had feared that 5 people at the same time might be too chaotic. I will update this when the whole gang has been ART-ified. Here is the whole gang. I had hoped to hang these up in the hall this weekend but need to pick up some more hardware first.